Furnaces have been around to heat our houses for centuries. Modern furnaces have been the results of series of improvements in technology and design. They have complicated designs compared to their old counterpart. However the basic parts of a furnace remain the same. The heat exchanger is one of these. To define a heat exchanger in simple words, it is the part that heats your air. The heat exchanger of a furnace typically looks like a set of tubes or coils that are looped repeatedly. The air passes over them to get heated. The shape of the coils is largely dependent on the model of furnace that you have, as well as what type of fuel that your furnace uses for combustion. Now let’s take a look at how the heat exchange of a furnace works. Once you power the furnace, the valve opens to release the fuel which reaches the burner. The fuel is ignited to generate heat. The heat then reaches the heat exchanger which becomes very hot. 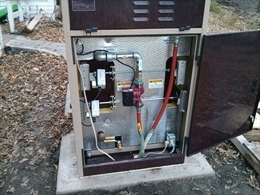 Your blower motor then blows air over this heat exchanger. The hot air is blown through the duct work into your rooms. All parts of a mechanical device are subject to wear and tear. So is a heat exchanger. 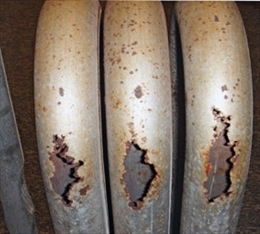 The heat exchanger of a furnace often gets cracked due to years of use. This is quite easy as it can lead to CO (Carbon monoxide) poisoning. This is because a cracked heat exchanger would lead to release of all sorts of dangerous gases that are formed due to combustion into your rooms. Therefore it is important to get a furnace serviced annually. These tune-ups detect cracks which are otherwise oblivious to naked eyes. The professionals would use some sort of test to detect the cracks. Let’s take a look at various tests to detect cracks in a heat exchanger. •The smoke bomb test - In this a technician would keep a smoke generator in the heat exchanger. He will then closely monitor the outside of the heat exchanger to determine if smoke is passing through the crack. • The pressure test – In this all the openings of the heat exchanger is taped up. A draft gauge is put inside the exchanger. The blower is powered on. If the distribution air is blowing into the heat exchanger, then there is crack that is allowing it. • The tracer gas test – This is also very similar to pressure test where all the openings in the heat exchanger are sealed. Methane tracer gas is inserted into the heat exchanger. A combustible gas leak detector is used to detect leaking of gas. • The salt test - A salt solution sprayed into the combustion chamber. Then a hole is made in the supply duct. A torch use to check if the flame that is coming out of the hole has changed color due to the salt. • The wintergreen test – In this oil of wintergreen is sprayed into the combustion chamber. The blower is put on. If smells of wintergreen in present in the supply register then there is crack. • The flame distortion test – In this the flame when the blower comes on is watched for any change in color, shape, etc.